“I’m a strength and conditioning coach.” That’s what most of us in the fitness industry call ourselves. But the truth is, many of us are much more confident on the strength side of things than we are with the conditioning side. Through my BioForce Certified Conditioning Coach Course, I’m doing my best to help smart coaches become 100% confident in their ability to write successful conditioning programs. But the fact remains: there’s still a lot of misinformation out there. Recently, I’ve noticed an unhelpful trend of articles, most of them seeming to imply that adding any sort of conditioning work to a strength program—particularly anything other than high intensity intervals—is a recipe to turn Arnold Schwarzenegger into Richard Simmons. The truth is, when programmed intelligently, conditioning work can actually improve strength and power gains. It’s all a matter of how you set things up from the start. Of course, there’s always a certain level of specificity that requires us to individualize each of our client’s programs to make sure we’re getting the best possible results. But there are also some guidelines/rules, if you will—that we can follow to make sure we’re writing the best possible strength AND conditioning program for our clients. Here are my top three rules. In order to effectively combine strength with conditioning, you must start by prioritizing your training. Both can be present, but one must take precedence. Trying to improve both at the same time is a recipe for poor results and where a lot of people go wrong. There’s one simple reason for this: energy. If you want to make progress, the most important thing is to choose how you want to spend your energy. Since building bigger, stronger muscles is an intensive process, it takes a lot of energy for the body to repair, rebuild, and remodel tissues throughout the body. Likewise with conditioning, improving the vascular network throughout the body and enabling it to deliver more oxygen to working muscles doesn’t happen without the body devoting a significant amount of resources to it. It takes a considerable amount of energy just to keep your body running, let alone build new muscle or other tissue. That’s why energy is often called the “currency” of the body: you have to spend it wisely since you can only produce so much in a given day. Regardless of your goals, if you want to make progress, the most important thing is to choose how you want to spend your energy. If you need to improve your aerobic conditioning, spend the majority of your time and energy doing just that, while only spending the minimum amount necessary to maintain strength and power. If you’re trying to get bigger and stronger, the first rule means that you should only do the amount of conditioning work than it takes to avoid losing what you already have. Doing more than that is not better. To avoid this common problem, conditioning work should be added to strength and power programs with the distinct goal of maintaining conditioning levels, rather than trying to improve them at the same time. While there are a lot of different factors that determine exactly how much training you need in order to maintain a fitness quality once you’ve developed it, a good rule of thumb is that it takes at least 80% of the overall volume that you would need to use to improve it. High level of conditioning: If you’re trying to maintain a high level of conditioning, you’ll likely need to include some form of conditioning work at least 4-5 days per week for 30-40 minutes. Moderate level of conditioning: If you’re only trying to maintain relatively moderate levels, 3-4 days per week for at least 30 minutes should do the job. Low level of conditioning: For low levels of conditioning, 3 days per week of 20-30 minutes should suffice to prevent it from getting any lower. If you’re starting with very low conditioning, however, you’re likely better off improving it up to at least a moderate level before focusing on strength and power. An easy approach is to start with these guidelines and then adjust as necessary. If you notice yourself losing conditioning, for example, then increase the volume by 5-10% and monitor to make sure it’s enough to maintain. 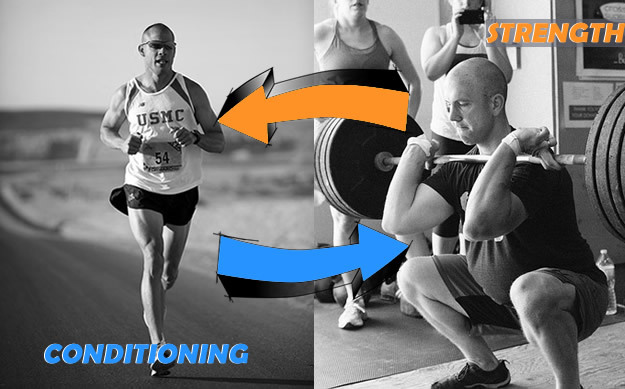 If you’re unsure of how to monitor your conditioning, here’s an article to help you out. The next most important element to effectively combine strength with conditioning work is to use methods that complement one another, rather than compete with one another. Use methods that complement rather than compete with one another. Which conditioning method should I use with my strength program? Choosing the right conditioning methods to use with a strength program doesn’t have to be complicated. To understand how to choose the right conditioning methods, it’s important to understand where strength comes from in the first place. Improving CNS neural drive to the muscles to increase fiber recruitment. Building bigger muscles capable of more force production. Greater sympathetic nervous system activation causing higher levels of hormones to be released. Training methods like max effort, dynamic effort, and plyometrics are all designed to improve nervous system function, while the repetition method is often used as a supplement to help increase muscle size. The thing to take note of is that all of these methods primarily rely on the anaerobic-alactic energy system to drive the majority of energy production during the work periods. Given their short, high-intensity nature, the alactic system is the only one capable of generating energy fast enough. Because the alactic system can’t produce energy by itself for very long, however, it’s up to the aerobic system to clear out the byproducts of anaerobic metabolism and restock the substrates the alactic system needs so it can produce energy again. This means that strength and power training is primarily driven by alactic-aerobic metabolism. All these conditioning methods use the same basic energy systems as strength and power training, which means they can be used to maintain aerobic fitness—without impairing strength and power gains. When programmed intelligently, some of them can even help improve strength and power gains by improving recovery through an increase in blood flow to fatigued muscles. How you organize your training can have a substantial impact on the results that you see. The reason for this comes back to what I talked about in the beginning: energy. Combining different types of methods in the same workout, or in the same day, will impact how your body stores and utilizes energy, particularly glycogen. And research has shown it can influence the genetic signaling that takes place as a result of the workout. It’s this signaling that stimulate changes in fitness, so it’s important to organize your training program in the most effective way possible. The specifics of how to do this, once again, depend largely on where you’re starting, since that dictates how much conditioning work you’ll need to do and how your body responds to training in general. Low fitness level: If you’re starting with a lower level of fitness, you can combine conditioning within the strength workout, but it should be done at the end of the workout. Methods like tempo intervals, HICT, sled dragging, work particularly well here. Moderate fitness level: At moderate levels of fitness, conditioning should be separated into different workouts if possible, but they can be done on the same day. If scheduling permits, conditioning workouts can be performed 4-6 hours after the lifting session as this will help promote recovery. Use fairly heavily loaded exercises with concentric-only methods like sled dragging and High Intensity Continuous Training. High fitness level: To improve strength and power at the highest levels, it’s best to separate conditioning work and perform them on different days. This separation is important to prevent any negative interference and to maximize the effects of the heavy strength and power work. Using a high/low approach where strength above 90% of max and lower intensity conditioning work are done on alternating days throughout the week is an effective approach for most. As you can see, the higher your levels of fitness, the more important it becomes to separate different types of training away from each other. The higher your levels of fitness, the more important it becomes to separate different types of training. This is because as your fitness improves, it requires more and more energy be devoted to both the training session and the recovery that takes place after. There’s a big difference in how much training and energy it takes to increase your squat from 400-500 pounds compared to how much it takes to increase it from 200-300 pounds. The further up the fitness chain you progress, the more important it becomes that as much of your energy as possible is focused on the specific demands of what you’re trying to improve. This doesn’t mean your training needs to become entirely one-dimensional, however. It simply means that separating different types of training from one another becomes more important than ever—especially at the highest level. Prioritize your training goals to ensure your body is spending energy where it’s needed most. It’s possible to maintain strength and power while boosting conditioning, just like it’s possible to maintain your conditioning while boosting your strength and power. Unfortunately, most coaches either try to improve both at the same time, or they focus on one and neglect the other. A middle path exists, which is the focus my conditioning certification. Work with your (or your client’s) fitness level. Combining different types of methods in the same workout, or in the same day, impacts how your body stores and utilizes energy. Depending on your fitness level, you’ll need to organize the training program in a way that allows full recovery.